I don't like to be very critical on this blog. I like to talk about how products change my life for the better, and make such an impact that I feel like I would be deprived of something great if I would never have tried it. Whilst I love being enthusiastic about products, I think it is important to be honest, I almost feel like I have a duty to be 100% honest on this blog. I have had this mascara for about 6 weeks now, and tried to use it numerous times, and I am at not at all impressed to be frank. 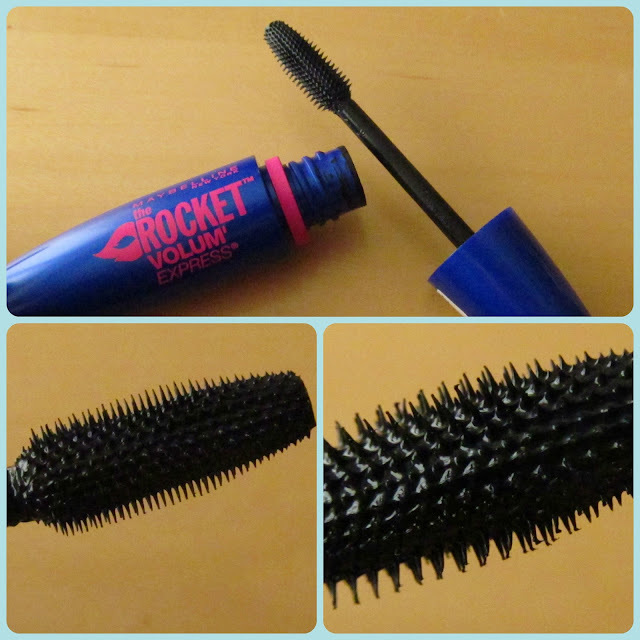 I like the packaging of this, nice and vibrant from the outside, and when I did catch my first glimpse of the huge brush, I was pleasantly surprised, I don't have any other mascaras that have a brush quite like this one. I have two fundamental flaws with this product. Firstly, the brush is so huge and pointy that it actually hurts the roots of my eyelashes and my lash line when I apply this. I have quite sensitive eyes anyway but this completely aggravates my eyes like no other product I have tried. I mean red, streaming eyes. No matter what I do with this brush or how much I want it to work, the stabbing and stinging of my eyes is actually so painful that I actually cringe a bit when I open the tube and take the wand out. I have to take a deep breath and brace myself. Now I know I have sensitive eyes but this mascara wand aggravates my eyes like no other applicator I have tried. Secondly, I hate the formula, I feel like it's too shiny and wet for my liking. I don't like how it looks on my lashes, almost like my lashes are wet instead of freshly applied mascara. If I didn't despise the wand on this, I would probably leave the top off it for a few hours to try to dry out the product a bit so it's not so shiny and watery looking on my eyes. Overall, this mascara was a huge fail for me, and in my eyes (geddit!? ), it really does not have any redeeming features. I won't use this anymore and I certain would never repurchase. I truly wanted to love this but this one is not for me, no matter how much anybody else loves it, I don't want to be blinded by a mascara. Does anybody else feel like this mascara doesn't quite live up to the hype or am I the only one who is not impressed?! Well I haven't seen this mascara before (I am currently using a Benefit Mascara and am happy with it so I don't bother to look around). The brush itself is actually ok, the one I use at the moment is very similar, only with little spikes at the top as well (looks like a torture instrument). I don't have any problems with it. But really shiny, wet looking lashes are not for me either. Don't feel bad about sharing a negative opinion on a product. It's important to share those as well ( I do it too, even if there is seldom a product I absolutely do not like). As long as it is written in a "professional" way and not laced with cusswords or unfounded riffraff, why not? and I think you presented your opinion great! And btw, it's actually nice to read a review that does NOT make me want to run off and buy more beauty products for a change haha. I was planning on picking this up! Definitely not going to bother now! I love Maybelline The Falsies too so while I'm happy I'm gonna just stay with it for a while! Your title is the best title for anything in the world!! Also great review - hate big brushes so staying well away! !